Today I would like to take you on a brief trip through time n one of my state’s most spectacular environments. 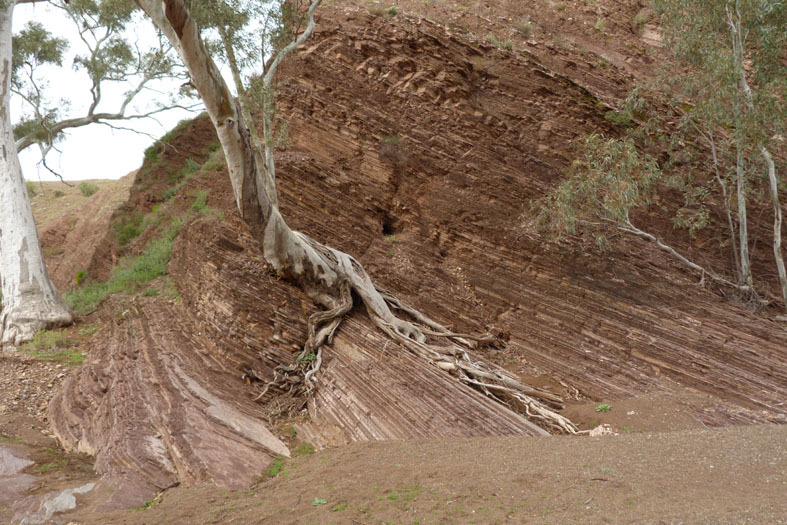 Hundreds of millions of years ago sediments were deposited on an ancient seabed. Over the following millennia, the sediments were compressed to form layers of rocks. In turn, the rocks were uplifted and folded creating a formidable mountain range. Eventually, the relentless action of wind, heat and water wore down the mountains and carved deep gorges through them. 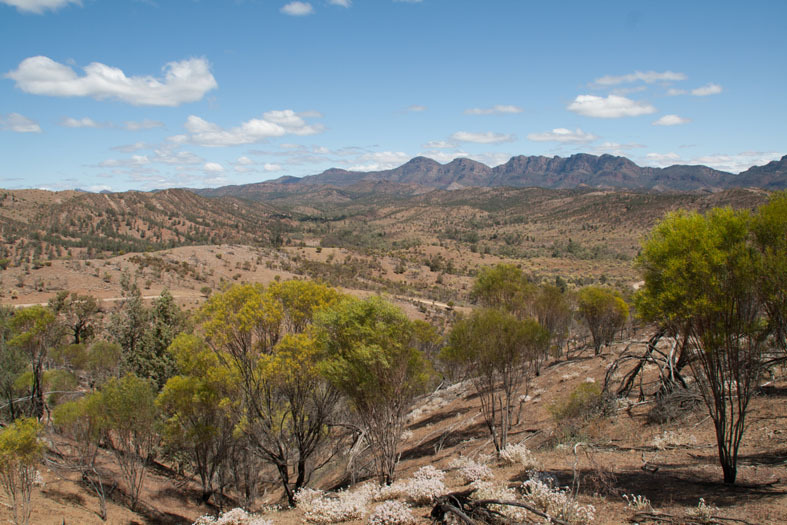 The result of this timeless process is the Flinders Ranges, one of the world’s oldest geological formations. Rising from the semi desert landscape some 400 Kms NE of Adelaide; they are a pleasant day’s drive through the rolling hills and open plains of the mid north’s wine and wheat districts. I have visited the Flinders many times and the rugged beauty and abundance of wildlife throughout the area never fails to impress me. However, on my most recent excursion I had a specific location and target in mind. Brachina Gorge crosses the ranges from east to west cutting through the layers of rock and revealing a unique insight into our planet’s ancient history. The 30 kms of rutted dirt track is crossed by several creeks and the geological history is traced by a series of interpretive signs. But Brachina’s rock formations are more than a glimpse into the past; they are home to one of Australia’s most beautiful marsupials-the yellow footed rock wallaby. 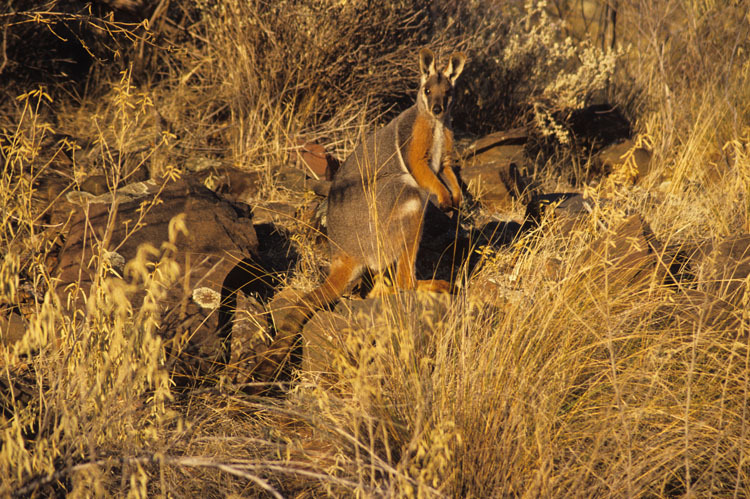 Small populations of yellow footed rock wallabies (Petrogale Xanthopus) are found in rugged areas of northern South Australia. 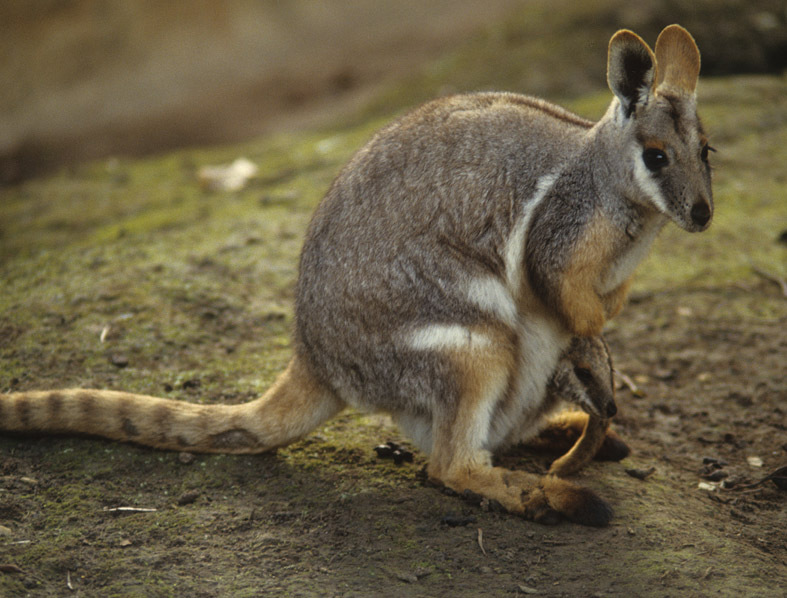 Like all wallabies they use their long tails for balance rather than locomotion. Their fur is thick especially on the feet where it provides cushioning and grip in the precipitous terrain they prefer. Yellow footed rock wallabies grow to around 60 cms in height and weigh7-13 Kgs They feed on vegetation such as grasses and forbes and sometimes graze on trees and shrubs during hard times. They are mainly active during the late afternoon and early morning. 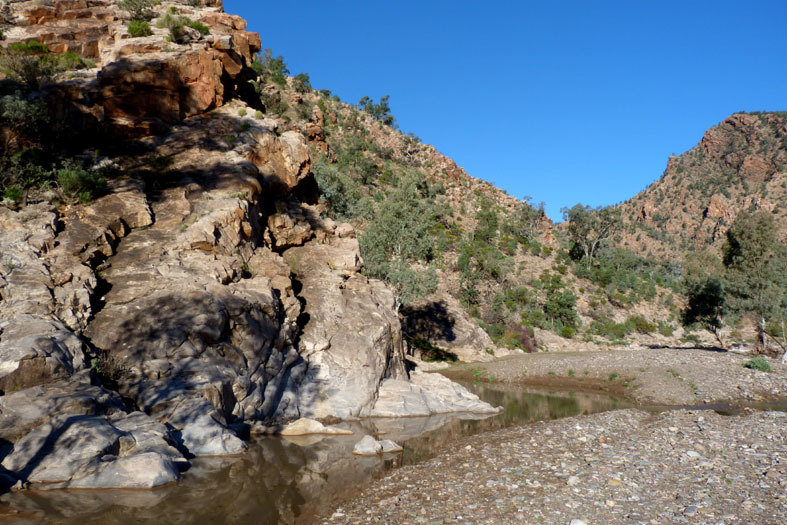 I entered the gorge from the Leigh Creek road on the western aspect of the ranges; and slipped my SUV into high range as there had been a little rain and the track was a little tricky. The flat terrain, where the creek flows out of the hills, quickly gave way to steep sloping rock walls and bush covered hillsides that characterise the Flinders’ gorges. After a few kilometres I stopped by a shallow pool of semi permanent water where a variety of grasses and low bushes were growing along the water’s edge. A jumble of rocks had fallen from the cliff face above creating some small caves and easy access to the shallow pools of water, the perfect environment for these agile little marsupials. For the best part of an hour I sat amongst the vegetation, camera in hand watching and listening. The light was beginning to fade a little and I my optimism was dwindling with it. Eventually I caught sight of a slight movement high above the rock-fall as a wallaby hopped from one boulder to the other-a long shot even with the 24X lens. I shifted my position to get a better angle and to my delight and embarrassment noticed a yellow foot feeding by the creek not 5 metres from where I was crouched. It must have been there for some time and seemed oblivious or indifferent to my presence. For the next ten minutes I watched and waited as the wallaby nibbled on the grasses and bushes surrounding the creek. I squeezed off quite a few shots and was about to call it a day when a second animal hopped onto a flattish boulder and stared pointedly at me. As I moved slightly it froze and gave me ample opportunity to capture a few more images. Sadly, I was reminded why these exquisite little animals came so close to extinction. Early settlers hunted them for their pelts and found them easy prey as their first reaction to a threat is to freeze and ironically, rely on camouflage provided by their subtly shaded fur. By the time I had finished photographing the wallabies, the sun was low in the sky and driving along bush tracks at night is not the safest of activities as kangaroos, emus, cattle and sheep seem to be drawn to headlights. 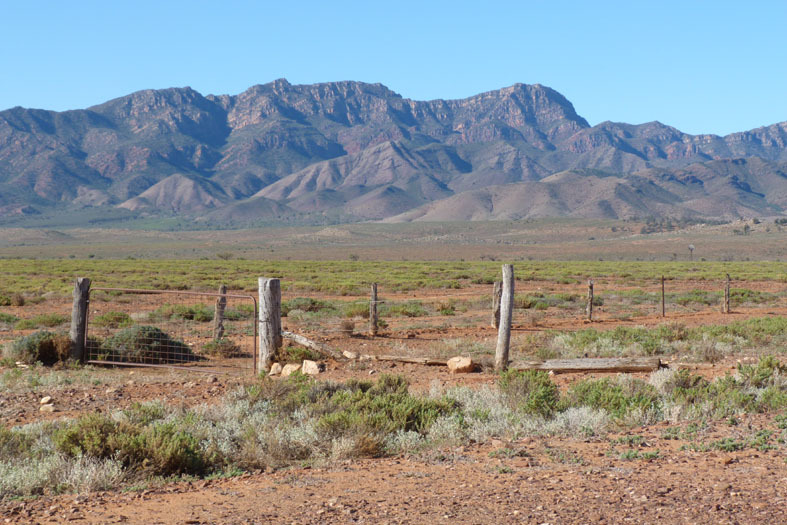 I packed up and headed on to Wilpena an hour’s drive to the west. 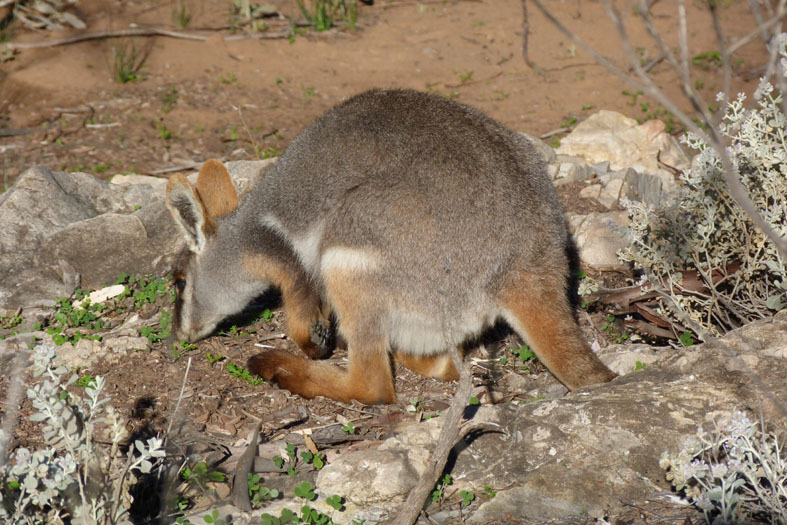 A sophisticated tourist development in a natural amphitheatre of towering cliffs, it would provide the perfect base to hunt for yellow footed rock wallabies in some other locations.